In case of snow, sleet, or freezing rain, we will air any cancellation on local radio and TV stations. Bear in mind that there are Westminster Presbyterian Churches in many other cities—including Waynesboro, Lynchburg, and Richmond. Please be sure you hear the announcement for Westminster in Charlottesville. 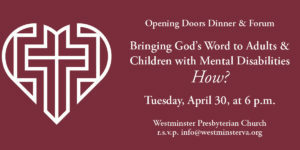 In addition, our website will have up-to-date information: www.westminsterva.org. Any weather-related changes to the worship schedule or other activities will be posted on the main page of our website. The church’s voicemail message will also announce any cancellations due to inclement weather. People who have specific responsibilities—like church school teachers, ushers, musicians, sound system engineers—should check one of the above resources if there is inclement weather. We hope we won’t be having inclement weather on Sundays, but please keep this information in mind if bad weather comes our way on the weekend.